Marcos, nicknamed 'China', lives in Rio. 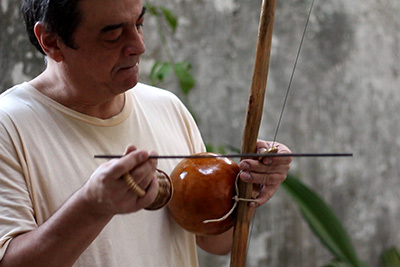 He is a capoeirista, musician and an instrument maker. Marcos used to live in France for many years and was very successful with his Band 'Tupi Nago'. 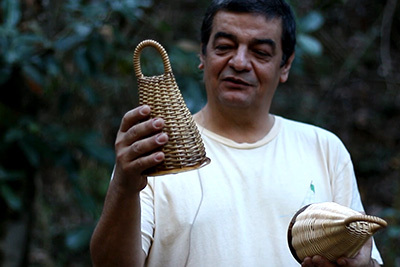 Back in Rio he started to make Caxixis because he wasn´t able to find any in the quality he wanted. Bit by bit he added other small percussion instruments to his range. He makes small series of instruments with extraordinary artisanal skills and love to small details. MARCOS CHINA keeps on inventing funny little instruments like the caixa de mesa, the saculegé or a minishaker made of plastic parts of PET bottles. MARCOS CHINA berimbaus are highly appreciated amongst capoeiristas as well as percussionists.